The dental microscope is the standard of care in current endodontic treatment. It allows increased magnification for succesfully completing endodontic therapy. It also helps detect cracks or other problems that could possibly prevent unnecessary treatments. It is used in surgical endodontic procedures as well. The more the doctor can see the better the result. 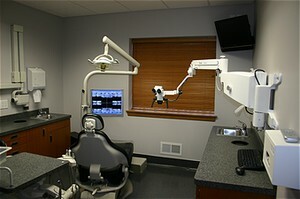 Betar Dental & Associates has had a dental microscope since 2005. Feel confident that you will receive the best care available.